Sake to Me: Saizo treats sake like fine wine, with the finest at $140 a bottle. IF YOU WERE a Japanese office drone out for a night of drinking with the boys, you'd head to an izakaya-style restaurant. Part pub, part eatery, izakaya restaurants serve small plates of grilled and fried dishes made to go with sake and beer. Think Japanese tapas. Unlike Japan, Spain and several other countries, America doesn't have a true food tradition built around drinking. Buffalo wings, Beer Nuts and pretzels hardly add up to a cuisine. Maybe that's why the small-plates phenomenon is such an enduring one in this country. And why we're so fortunate to have a place like Saizo. While sushi bars and ramen houses in Silicon Valley abound, izakaya restaurants are a rarity. Like the best ethnic restaurants in Silicon Valley, 2-year-old Saizo occupies a storefront in an anonymous-looking shopping center. Inside, the restaurant has a long wooden bar on one side and a bank of tables against the wall on the opposite side. The dining room is sparely decorated, but the low-hanging ceiling and wood finish give it a warm, inviting feel. While Saizo's specialty is izakaya-style dishes, they do offer noodles, dinner entrees and ochazuke, broth-filled iron pots to which you add various grilled and raw seafood. But I came for the bar food. Before I get to the food, I should mention the drink. Sake is poised to break out of the confines of Japanese restaurants and go mainstream, and Saizo is a great place to get acquainted with it. Like wine made from grapes, the character and quality of rice wine varies greatly by region and producer. I'm a fan of unfiltered sake, a milky, slightly viscous, semidry rice wine served cold. A small glass of nigori goes for $5. It's served in what looks like a tall shot glass that sits in a wooden box, another vessel used for drinking sake. As my server poured, she let it overflow and partially fill the black lacquered box. This was new to me so at first I kept returning the glass to the sake-filled box each time I took a drink. But I decided it was best to remove the glass from the box. Once I finished it, I drained the box. 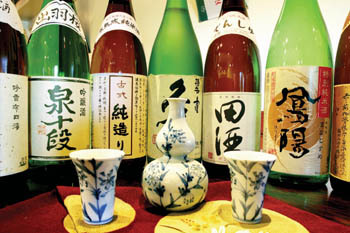 Saizo offers a number of premium sakes ranging from $68 to $140 a bottle. (Prices on the current menu are expected to change as vendors up their prices.) A less expense option is the sake flight ($8), which allows you to sample a number of different rice wines. Saizo has Kirin on tap ($3.50) and several other Japanese brews by the bottle. If that's not enough for you, the restaurant also pours several kinds of soju, a vodkalike spirit made from either potatoes, barley or sugar cane. While Japanese is the first language of the restaurant's waitstaff, the two waitresses I encountered were friendly and happy to answer questions about the menu. Even as the place filled up and got rowdier, the servers and the kitchen kept the food and drinks coming quickly. The izakaya menu is divided into grilled and fried items. Prices range from $1.25 to $9.75, so you can order a wide variety of food for little money. We ordered nearly a dozen items. Some of the food, such as the beef tripe ($1.70), eel liver ($2) and beef tongue ($6.50), may put off the less adventurous. If that's you, start with something tamer like the wasabi chicken skewers ($2.25 per skewer). The white-meat chicken verges on dry, but the charred flavor from the grill and the cleansing heat from the horseradish gives it life. Also good is the yuzu-pepper chicken skewer ($2.25). Yuzu is a distinctive Japanese citrus with bright, high-toned flavors that pair well with the chicken. On to a more advanced dishdon't miss the butabara ($1.80), three strips of deliciously fatty grilled pork belly. We have an aversion to fatty meat in this country so avoid the urge to push the buttery fat aside. It's like bacon fat (bacon is cured pork belly), only it melts on the tongue with a mouth-coating richness. Speaking of bacon, the kaki bacon ($3) is another not-to-miss item. Bacon-wrapped oysters are grilled until plump and blistered and then filled with hot, savory juices. I love oysters and bacon on their own, but together, they ascend to another level of succulence. An order of Saizo's pickled vegetables ($4.75) helps cut through all the rich grilled meat. The carefully cut slices of cucumber, daikon, sweet potato, carrots and other vegetables offer a refreshing, palate cleanser. Considering their local abundance, health benefits and status as a sustainable fishery, I'm surprised that more restaurants don't offer fresh sardines. I take it as a sign of Saizo's enlightenment that it has two sardine dishes. Iwashi maru ($4.75) are sardines at their best, grilled whole and adorned with just a slice of lemon. For those used to the canned version, whole grilled sardines are a revelation. Meaty and pleasantly oily, the silvery-skinned fish are best eaten like a tiny ear of corn with a squirt of lemon juice. Iwashi nanban ($4.75) are more involved. Vinegar-marinated sardines are fried in a thin batter and served with pickled vegetables in a subtle yet sharp vinaigrette. Saizo's grilled beef tongue, called gyutan on the menu, could make converts of those averse to this special cut of meat. Sliced thin and grilled with what tastes like just a sprinkle of salt, the meat is tender and pleasingly beefy with none of that gamey flavor that can turn some people off. If you're not up to that, try one of Saizo's rice balls. Not really a ball but more of a rounded square, the yaki-onigiri ($4.75) is heavily seasoned with miso and ginger. Outside, it's crusty and scored with grill marks and moist and steamy inside. This hard-to-find dish takes a while but is worth the wait. The subtly salty, fatty flavors of most of what we ordered made our drinks go down even better. I swear, beer never tasted so good. But the food does more than taste good. Research has shown that eating protein while sinking drinks helps keep hangovers at bay. The Japanese are definitely onto something. My Pabst and pretzels days may be over. Address: 592 E. El Camino Real, Sunnyvale. Hours: Open daily for lunch and dinner Mon–Sat. Cuisine: Izakaya-style Japanese (small plates).